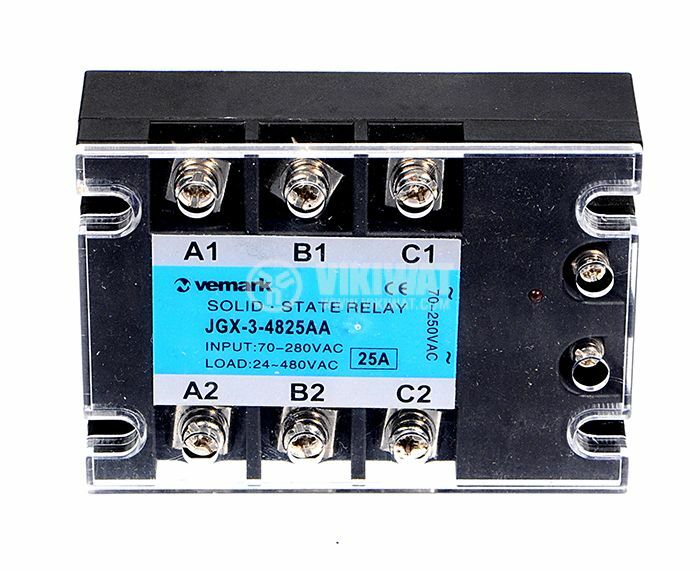 SSR Relay three phase, with switched voltage max. 480 VAC,current load max 25 A and control voltage from 70 VAC to 280 VAC. List Price 74.00лв. VAT Incl. 70.30лв. VAT Incl. 66.60лв. VAT Incl. The maximum load current is achieved using a corresponding radiator; The company Vickani recommends you an aluminum cooling cooler 200 mm, 145x35 mm - to be mounted vertically on the ribs. To reduce heat resistance, it is recommended to place a thin layer of thermopathic material between the radiator and the SSR relay housing. The picture shows the dimensions of the product.